And it gets worse. Many commercial pet food companies use meat by-products (part of animals not commonly eaten by our pets even in the wild), rendered meat (commonly found in dry foods as a “meal” or “meat and bone meal” that’s made from animals condemned for human consumption), and preservatives and additives such as butylated hydroxyanisole (BHA), butylated hydroxytoluene (BHT), propyl gallate, and ethoxyquin. Ethoxyquin is one example of a preservative that is banned from human food due to its known cancer-causing properties. Contaminants in pet food is far too common as well. These often include pesticide residues, antibiotics, molds, and drugs from downer animals. And many pet foods companies include a high percentage of grains in their food (especially corn, wheat, and soy) which is not meant for carnivores like dogs. As pet lovers, we owe it to our dogs (and all pets) to give them best nutrition possible. 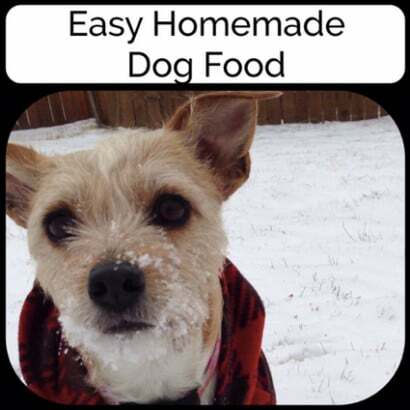 Easy Home Made has created a great homemade dog food recipe. This is a meal that she prepares for her own pooch, Poppy. This recipe calls for human-quality meat, eggs, vegetables, and even herbs. Best of all, Poppy approves! When shopping for homemade ingredients, source products that are organic, non-GMO, and grass-fed for ultimate nutrition. Short on time or traveling and unable to make you own food? Consider the Halo brand which has an outstanding reputation for making quality dog food that sets it apart from the majority of commercial pet food companies.